If you are thinking of building your own camper van the images on these websites are good for ideas. 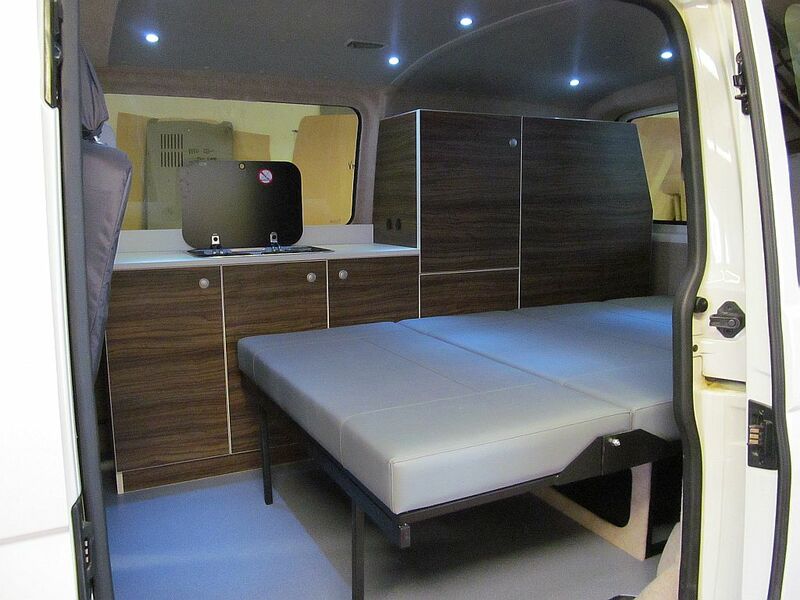 Advertise your campervan conversion business here! Contact me for more information. Hi there, I am wanting to convert a t5 and was wondering if anyone could recommend a company. Im based in the Northwest so preferably in my area. Hi Folks, purchasing a T5 from the auctions tomorrow, and planning on buying internal kits and parts from ebay. After a company based in the Midlands to then do the labour side of things for me i.e insulation and lining, electrics, plumbing, fittings etc..
Do you think this is the most cost effecient way of doing things? Can any one recommend a good company in the East Midlands to do the labour and finishing? Hi, Ive just had my van converted by a company called creation campers, there in wrexham, north wales, They were very helpful and I am made up with the finish of the van and also the service they gave me, I would recommend them highly. Does anyone know where I can get Venetian blinds for a t4? Venetian blinds in a campervan are not a good idea. They rattle and clang a lot. Bamboo blinds are a better idea. Standard practice is to use copper pipe to all appliances. Flexible hose should only be used from the gas bottle regulator to a manifold. From the manifold copper pipes should be used to the appliances. No need for PVC covered pipe, although this helps battle corrosion for pipes on the outside of the van floor. Does anyone have a professional conversion outfit that they recommend who are able to to do a camper conversion on as Nissan Elgrand and are based here in the South East? This may not help but Elite Camper Conversions in Worksop, Derbyshire list the Elgrand as one of there conversions. Does anyone have any knowledge of conversion firms on the continent who tackle clients own vans. can anyone tell me where i can get reasonable insurance im about to purchase a van to convert to a camper but am quoted vast amounts for insurance the quotes iv got for the van once done are a quarter the price of pre conversion. is there a policy or way round this whilst the conversion takes place? Several companies offer a policy that gives you 90 days (and normally a bit more) to do the conversion. They insure you throughout. such a kit of some description. Thanks. They are amazing and I had a great experience dealing with them.You can read my testimonial there. i have just bought a t2 bus (empty inside) and wanting to convert it into a campervan..
any help in which order i start to tackle this project..
Im looking for a reliable source that can provide conversion kits for VW s and sprinters…. Any advice would help. I am looking for advice about reputable companies I could deal with to buy a camper van. Any suggestions? I would recommend buying from a dealer close to you. If you have any teething troubles, it always good to be able to take the vehicle back for adjustment. i have for sale a 2008 VW T5 camper van with a reimo conversion. if you interested and would some photo’s please email me. Pop top heaven or go Westy.